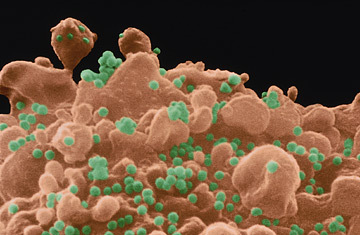 A T-lymphocyte white blood cell infected with AIDS virus (green). After 20 years of defeat, it appeared that science may have finally developed a viable vaccine against AIDS. Merck's new drug, V520, was being tested in a huge clinical trial, involving 3,000 people in 15 cities, and it was widely considered the most promising new candidate in the field. But last September, when Merck analyzed its initial trial data, it found that the vaccine had failed  and failed miserably. On Wednesday, the company issued its first report on the V520 trials, revealing that the drug did not protect against HIV, and more disturbingly, actually may have increased some people's susceptibility to the virus. "I don't think anyone imagined the results would be so definitively negative so quickly," says Dr. Gary Nabel, director of the Vaccine Research Center at the National Institutes of Health. V520 may have failed, but somewhere in the details of the drug's nonsuccess, scientists hope to find insight into what will make future vaccines work. After all, V520 is just one of about 50 experimental HIV vaccines that are currently being tested in clinical trials, and almost all of them are designed to function the same way. While most vaccines expose the body to weakened or killed viruses, or pieces of them, to boost production of antibodies  proteins that recognize invading cells and flag them for destruction  that tack alone was too feeble to fend off HIV. The new class of vaccines, including V520, takes a more direct route: They trigger cell-mediated immunity, which marshals killer T cells that both recognize and destroy viruses and bacteria, and can lead to a more robust, specific and longer-lived immune defense. It's not yet clear why V520 didn't work, but one theory involves its vector, or delivery vehicle. Like a number of other AIDS vaccines in development, Merck's drug used the common cold virus to transport its payload  three synthetic HIV genes  into the body's cells. What makes the adenovirus ideal for the task is precisely the reason colds make us so miserable  once inside a host, the cold virus infects cells and starts to replicate quickly. The down side to that efficiency, however, is that cold viruses are so common that most people have developed a certain level of tolerance to them; if the adenovirus fails to excite the immune system, then any bugs piggybacked on the virus, such as HIV genes, will also slip past immune defenses. That's exactly what appears to have happened in the Merck trial: People with the highest pre-existing immunity to the common cold also had the highest rates of infection with HIV. "It could be due to chance, or to differences in the populations we studied, or to something related to the vaccine itself," says Dr. Keith Gottesdiener, vice president of Vaccine and Infectious Disease Clinical Research at Merck. "The 'why' is still not well known." Researchers have already set about trying to figure it out. "We have to remember that Merck's was a single product testing a vaccine concept, which is that T cell immunity can protect against HIV infection," says Nabel. "And we know there are other ways to stimulate T cell immunity." Nabel is ready to test one such method, a vaccine similar to Merck's that uses different HIV genes and a "prime-boost" approach that involves two injections spaced a few months apart, instead of one shot, to maximize the stimulation of the body's T cells. Other researchers, like Dr. David Ho, director of the Aaron Diamond AIDS Research Center in New York City and the recipient of a $25 million grant from the Gates Foundation to study novel vaccine strategies, think that the cold virus isn't the best way to deliver HIV. Ho is exploring the possibility that a different vector, such as the chicken pox virus, or perhaps no vector at all  simply injecting snippets of naked HIV DNA  could yield stronger immune responses. At the International AIDS Vaccine Initiative (IAVI), a non-profit group of public and private partners focused on funding and accelerating AIDS vaccine research, scientists are conducting animal studies of crippled, live strains of HIV  based on the success of other such live attenuated vaccines against polio and measles. They are not considering using such a vaccine in humans, but the experiments could provide greater insight into how the immune system works. "There is something magical about the replicating virus, because it has virtually its entire genome," says Dr. Seth Berkley, president of IAVI. His group is also investigating ways to stimulate so-called neutralizing antibodies, a special class of antibodies that appear to be able to defuse HIV. Despite the ongoing study, experts argue that none of it will succeed without some basic changes in the way it's conducted. Most research occurs in isolation; there's little coordination among labs and no network through which data can be shared, making it difficult for scientists to learn from each other's missteps. Worse, it takes years to get regulatory approval to start a human trial for a new vaccine  not to mention enrolling the volunteers and training the right personnel  so, by the time experiments get underway, the science around which the vaccine was built has long since become outdated. "The trials are not informing science at the moment," says Dr. Alan Bernstein, executive director of the Global HIV Vaccine Enterprise, an alliance of independent organizations dedicated to accelerating HIV vaccine research. "Science  and vaccine development  is an iterative process, except that in HIV vaccine research, there isn't a lot of iteration going on." The Enterprise, which was founded in 2005, intends to change that. With funding from the Gates Foundation, Wellcome Trust, National Institutes of Health and the European Union, it will serve as a hub for guiding worldwide HIV vaccine research. �We want to ensure that the trials are done faster, better and smarter,� says Bernstein. And hopefully, with more success.